Hakusan, Japan, September 1, 2015 – EIZO Corporation announced it is now offering a white cabinet option for three FlexScan monitors with ultra-slim bezels. EIZO is making the monitors available in white to compliment the aesthetics of the modern office. White is associated with traits such as cleanliness, purity, and simplicity. These are qualities that EIZO is expressing through the monitors’ minimalist design as well as their focus on visual ergonomics and minimal environmental impact. FlexScan monitors typically come in a choice of black or gray cabinets. 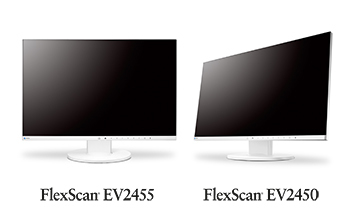 EIZO will now offer white for the FlexScan EV2455 (24.1-inch screen) and FlexScan EV2450 (23.8-inch screen) as well as the new FlexScan EV2750 (27-inch screen) which the company announced today. The FlexScan EV2750, EV2455, and EV2450 in white are now shipping. Date of availability varies so contact the EIZO subsidiary or distributor in your country for details. All product names are trademarks or registered trademarks of their respective companies. EIZO, FlexScan, and ScreenManager are registered trademarks of EIZO Corporation.